This spider was in a wooded area consisting mostly of pines. It was in an area several hundred yards from the Intercoastal Waterway. This area used to be a tomato farm but has been abandoned for several years. A friend bought the property for deer hunting. there are several driving paths through the woods. This spider had a web stretched between two trees across one of these driving trails. we slowly drove through it and the web stretched across the windshield. 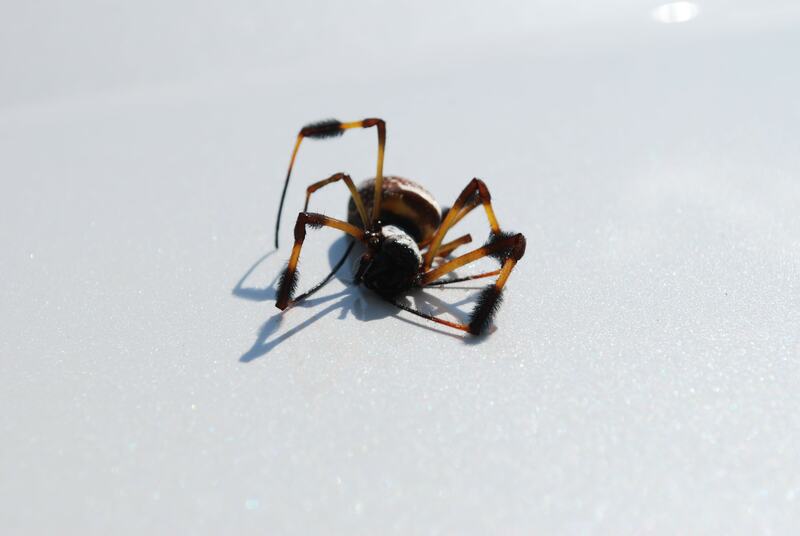 The spider crawled up on the roof and when we got back to the cabin it was hanging off the side of the car dead. I thought I had taken a photo of it beside a quarter but I can't find it. The spider was as big as any I have ever seen. It is one of the Golden Silk Orb Weavers in the family Araneidae. In SC it is most likely Nephila clavipes. Have a look here: https://spiderid.com/spider/araneidae/nephila/clavipes/ for comparison.